The history of the mansion started with the purchase of Poltava merchant Sergei Arshavsky land outside the Count (now Lutheran). 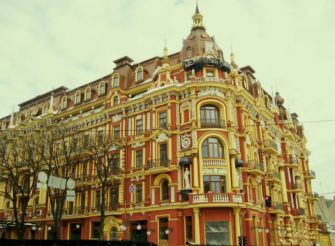 The place was not chosen by chance, because the street was located in the city center and has been the most picturesque area in the city. The local house immersed in the green mulberry trees and lush wreath vineyard, giving a sense of privacy. Therefore, this street has become a favorite place for walks in the local elite. 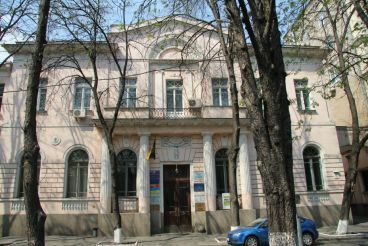 Immediately after the transaction, the merchant ordered to draft a new home Kiev architect Edward Bradtmanu. Wanting to make a name, Sergei Arshavky decided to leave behind a masterpiece of architecture and therefore spared no expense or at work, or on materials. And two years later, in 1908, at the Count`s wearing the two-storey mansion in the style of early modernism. 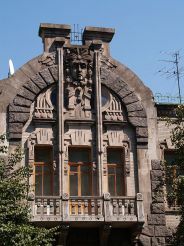 The exterior is decorated with yellow brick and olive ceramic tiles on the facade of a lot of moldings of cement, the elements of granite and wrought iron. This rich design gives the building a kind of mysterious to this day. 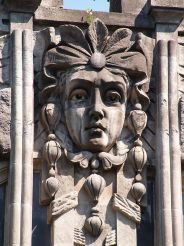 The main decoration of the house - a statue of a beautiful woman`s face on the front facade, which has given rise to many legends. Researchers are still arguing about who owns the female face: miracle-Gamayun bird, bird of paradise Sirin, Medusa or the Indian goddess Lakshmi. There is also an opinion that the person is the wife of Sergey Arshavsky that longed for her husband for five years after his death. If you look at the house in the rain, you can see how to face the mysterious tears flow. And once it becomes clear why it is called the "House of the Weeping Widow." In 1913, the house changed its owner and was later nationalized and has undergone renovation. 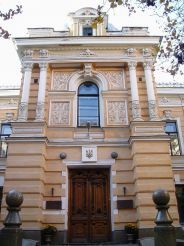 Since 1994, the house became the official residence of the President of Ukraine. Today it stop foreign delegations and guests of the President. For simple visitor entrance is closed, but still possible to admire the architectural masterpiece outside. 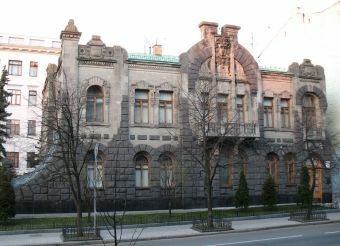 In this mansion, the residence of the two main entrances: the main - from the street Lutheran, and the other - from the street Bankova. Access to the famous house can be on the subway. Nearest station - Khreshchatyk. Also on Bankovaya is the famous House with Chimeras .